Hollow Fragment sold a total of 450,000 units worldwide. New details on Sword Art Online: Lost Song, due out for PlayStation 3 and PS Vita in Japan on March 26, have come out of a Dengeki Online interview with producer Kawai Yasukazu. 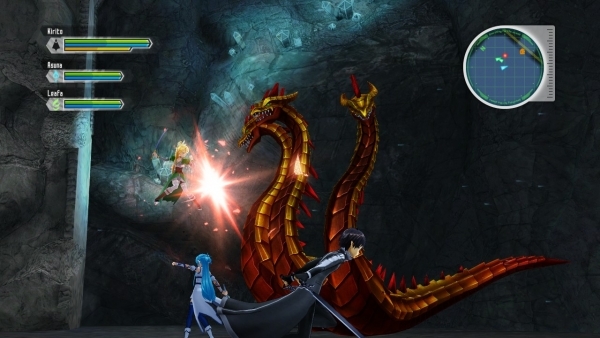 For Sword Art Online: Hollow Fragment, Bandai Namco listened to user feedback from Sword Art Online: Infinity Moment, which led to at least 100 changes. Hollow Fragment sold a total of 450,000 units worldwide. In Japan, sales were about 280,000. In Asia, 90,000. And in North America, the game sold about 70,000 units. While Aquria handled Sword Art Online: Infinity Moment and Hollow Fragment, Artdink is developing Lost Song. Artdink was decided as developer around the time production of the second season of the anime was decided. Yasukazu once said that a Sword Art Online: Hollow Fragment sequel would be made if it sold 200,000 copies. Lost Song is not a sequel, but something completely new. There was only one thing left unresolved in Sword Art Online: Hollow Fragment, and that was the “Save Strea Story.” Strea and ALfheim Online are bound to one another, and even if players would be happy to see her go, she can’t just up and disappear from the game. Lost Song will look into these points more closely and Yasuzaku hopes that players will ultimately be able to come around to her. Bandai Namco is planning to release updates to Lost Song, just as they did with Hollow Fragment, post-release. The content and timing is not clear, but it will incorporate user feedback. There will also be downloadable content, such as new missions, but it will all be free. Yasukazu wants to continue doing Sword Art Online stuff as much as possible, both apps and consumer games alike. He jokingly adds that he’d like to make a virtual reality MMO himself, and that it would be nice if Bandai Namco could come together to advance virtual reality in its own way.